So the new academic semester is underway here in Taiwan – week two will begin on Tuesday after the 228 Memorial Day holiday. This will be my final semester studying in Taiwan, and should be quite different than my previous three semesters here, in that I have no classes this time around. I was able to complete all my course requirements during my first three semesters, so now I am free to focus on the final piece of the puzzle – my thesis. I’ve been pretty satisfied with my progress on my thesis thus far. A month ago, I hadn’t even written the proposal, and now I’ve already got a pretty good first draft of the first two chapters done. My deadline is mid-May to turn the final product in to my advisor, and the defense should go in the first half of June. It’s going to be a lot of work, but already in the short time I have been working on it, I have enjoyed the fact that its production is truly my responsibility and that I can basically follow the research where it leads. June will be our last month in Taiwan. Yes, nothing lasts forever, and I’ve already got orders to my next assignment. As luck may have it, I’m headed to Denver, Colorado to be a company commander. I am looking forward to that duty. I guess I will have to decide at some point whether or not I want to continue with exclusively Asia-Pacific focus for this blog after that, or if perhaps a transition to a more “general-purpose” military blog would be more in order (something like, I don’t know, maybe Wings Over Iraq? – by the way, I just noticed this blog made the blogroll there – thanks, Crispin!). Regardless, rest assured that Taiwan, China, and the Asia-Pacific will remain vital interests of mine and that material related to the same will appear here from time to time whether or not the overall focus shifts once I move from Taiwan. But in the meantime, it’s nose to the grindstone for me! That, and a little traveling to indulge in a hobby, triathlons. I will head to Singapore next month for a race and then to the Beijing area in May for a final hurrah before heading back to the U.S. Completely unrelated to all that, but of interest nonetheless, I commend your attention to a new blog written by one of my classmates at National Sun Yat-sen University. It’s only been around for a little over a month, but already Observations, Comments, and Whatnot is chock full of opinion and well, commentary on Taiwan, China, and more. Head on over and check it out: http://observerlhs-observations.blogspot.com/. The author, Nathan Novak, is averaging greater than a post a day so far in February, and they are not short ones, either. Finally, at least one of his posts has been picked up for publication by the Taipei Times after he posted it to his blog. Take a look. Since my last post, I’ve been busy pursuing my hobby (triathlons / triathlon training), made a quick trip back to the U.S., and as of late, been burdened quite heavily writing papers and presenting on them at grad school. First, I’d like to talk a little bit about this last point, sharing a little bit of what I’ve been researching, writing about, and presenting on. I’ll also share what remains “in the hopper” – requirements left to be satisfied before the end of the semester about a month from now. Be warned: there will also be a fair amount of miscellany tossed in for good measure! I wrote a paper and made a presentation this week entitled “China’s Rise and the South China Sea.” I find China’s recent aggressiveness over its claims in the South China Sea to be part of their overall trend toward consolidation of territorial claims, both maritime and land-based (for example, the September 2010 row with Japan over the Chinese fishing boat which rammed Japanese patrol vessels near the Senkaku / Diaoyutai Islands not far from Taiwan in the East China Sea is another example of aggressive behavior over a disputed maritime claim). While China’s claim of “indisputable sovereignty” over the South China Sea made just after the July ASEAN Regional Forum in Hanoi made headlines, in fact China has been making the same types of claims about the South China Sea for decades, going back to not long after the establishment of the People’s Republic. What was significant in China’s rhetoric about the South China Sea this year was the elevation of the area to “core national interest” status, something that heretofore only long-standing PRC irredentist claims such as those involving Taiwan or Tibet were assigned. Looks to me like China is positioning itself to be more aggressive about the South China Sea, not less. There is a chance that the paper might be accepted for publication next year in an edited book on topics related to China’s foreign policy produced by my school, National Sun Yat-sen University (NSYSU), so I will refrain from posting it until that situation is sorted out. Papers I am still working on this semester include an examination of the continuing utility of the 1979 Taiwan Relations Act that established the current non-official relationship between the United States and Taiwan when the U.S. decided to switch official recognition to the PRC, another on non-traditional security issues in Southeast Asia (probably focusing on pandemic disease threats and response preparation, since this [East Asia] is the region that suffered the most in the SARS outbreak back in the early 2000s and has also been subject to not a few bird flu scares). The final paper will deal in with national security / crisis management, and will likely revolve around a case study of one or both of the Quemoy crises in the 1950s. I talked in a recent post about deliberations over selecting a thesis topic. I decided that the anti-access/area denial (A2AD) realm is the one I am truly interested in with regard to China’s military modernization, so that will be what my thesis will be on – the effect of China’s development of A2AD capabilities like the anti-ship ballistic missile (ASBM) and associated systems on Taiwan Strait security. At the very least, the Navy guys should be interested in it. We continue to benefit from NSYSU professors “mining their Rolodexes” when they will be unable to give classes due to international travel or other conflicts. This week Ambassador Feng Tai (酆邰), formerly Taiwan’s ambassador in Tuvalu and 37-year veteran of the Ministry of Foreign Affairs, delivered a talk on crisis management and negotiating skills. By far the best parts of the talk were when he leavened it with personal anecdotes from some of his own experiences, from hosting the Saudis here in Taiwan in 1990 when the Kingdom of Saudi Arabia was weighing switching its recognition of Taiwan to the PRC (it ultimately did so) to stories about preparing to negotiate with meticulous and well-prepared Japanese and Chinese delegations on various issues. Ambassador Feng mentioned that he is weighing retiring from the MOFA next year and going into academia, teaching foreign affairs at a university in Taipei. 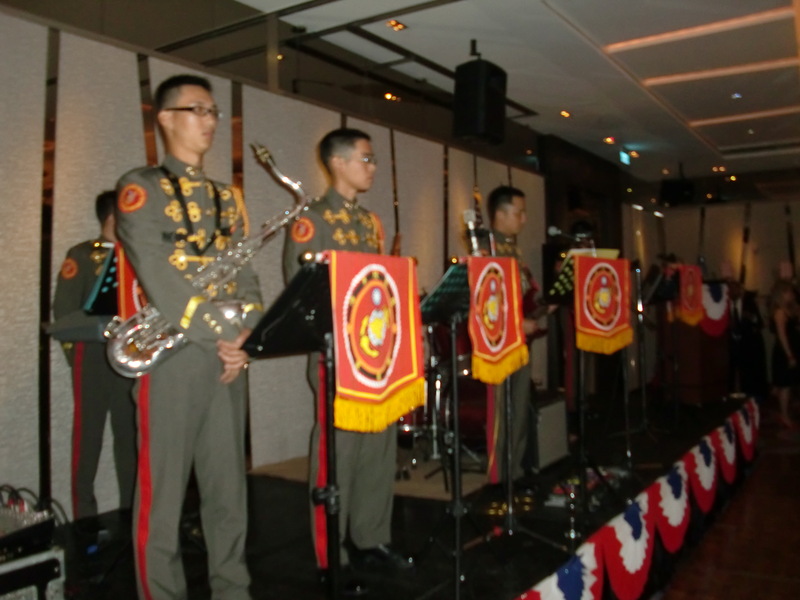 Not really related to academic affairs as the rest of this post has been, but interesting nonetheless: last month I traveled to Taipei to attend the U.S. Marine Corps birthday celebration. The U.S. Marine Corps was established 10 November 1775, and every year about that time Marines pause to remember fondly those who have gone before us. The interesting part about this year’s celebration here in Taiwan was that it was the first official celebration of any size since the late 1970s when the above-mentioned Taiwan Relations Act was passed. For decades after the TRA, there were no active-duty U.S. military officers stationed as attaché with AIT. It was only in 2005 that the first active-duty military folks returned to AIT. A couple years later, the first post-TRA U.S. Marine attaché came to Taiwan. Since that time, every year the celebration of the Marine birthday grew a little bit, and now, in 2010, the celebration of the U.S. Marine birthday here in Taiwan (235 years young!) was on par with celebrations held at places with very robust U.S. Marine presences (like Marine bases in the U.S. or Okinawa). There was one key difference, though – here we were able to celebrate hand-in-hand with out R.O.C. Marine counterparts, who attended in force this year, led by their Commandant, Lieutenant General Hsia Fu-Hwa. The Taiwan Marines were even gracious enough to offer up their band’s jazz ensemble to provide the music for the event – that’s them in the photo at the top of this post. (Good thing, because we couldn’t make much of a U.S. Marine band here with the two of us, no matter how talented we are!) I have no doubt that in the future these birthday celebrations will only become more and more like the finer Marine Corps Birthday Balls put on by embassies and equivalent worldwide each November. Blogroll update: I’m adding the Lowy Institute, an Australian think tank that put out a fine report on the future of security in Asia this year, and also China SignPost, an effort by Dr. Andrew Erickson of the U.S. Naval War College and Gabe Collins. They publish periodic analytical briefs on various aspects of China and the world. I’ve found especially their report on how China’s dependence on oil imported by sea will only continue to increase, despite efforts at developing overland pipelines.